This page is divided in three parts, corresponding to the three needs in transport that you will probably have during your trip in London. You have two main choices to go to London: by train, or by plane. Each time I needed to travel between Paris and London, I took the train, but I think there aren't a right and a false choice, because of all the parameters of the travel, the starting point and the final destination. Furthermore, prices are equivalent. London is a big city, almost 6 times bigger than Paris (Paris : 105 km², London : 593 km²). More than a good map, you will need a good knowledge of TFL network (Transport For London). Transport For London is a local government body for the transport system of London and greater London. Thanks to it, you will be able to take the tube or buses all over London. The principal problem of TFL is the very high prices. To compare one more time with Paris, one tube ticket in London is 4 times more expensive than a tube ticket in Paris (Paris : 1,5 €, London 4 £, equivalent to 6 €). If you want to pay less, I'm sure you will enjoy the following advices. Don't worry, you won't pay the higher price when you will use TFL services. The first thing to do when you will arrive in London is to by an Oyster Card. You will use it each time you travel, by touching it at the entry of the tube station or in the front of the bus. The price will depend of the frequency of you travels. First, if you are sure that you will travel every days (in order to go working for example), you will buy a travel card (weekly, monthly, or more) and you will pay each week the same price (this price depends on the geographical area). If you don't want to lose one minute finding the good bus, you may choose the tube. Indeed, it's easiest to find your way in a tube map. But if you don't want to lose one pound, you may choose the bus, particularly if you want to travel between two big stations. Indeed, if you have to take two lines before your destination, you will have to pay two fares. A single fare in bus cost with the Oyster card only 0.80 £, instead of the 1.50 £ of the tube. During three months, you will probably want to go outside London in order to visit well-known places in Great Britain. Unfortunately, the railway network is awful in UK. I'm sure you will spend a lot of time to understand it and to find useful tips. 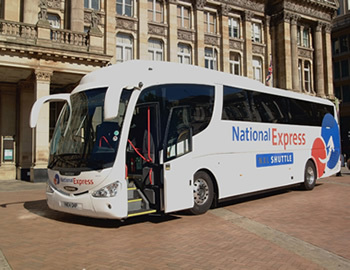 It's why I chose coaches when I wanted to visit UK, especially the company National Express which provides good services for a sensible price. You can for example reach Birmingham only for 5 £ with a comfortable and modern coach.